Alexander Gray Associates gallery in Chelsea is currently exhibiting recent work of Harmony Hammond. In the 1970’s Hammond was an influential feminist artist. Her current work is abstract, but with an emphasis on process and physicality. The materiality of these almost monochrome works relate to earlier themes of the human body. 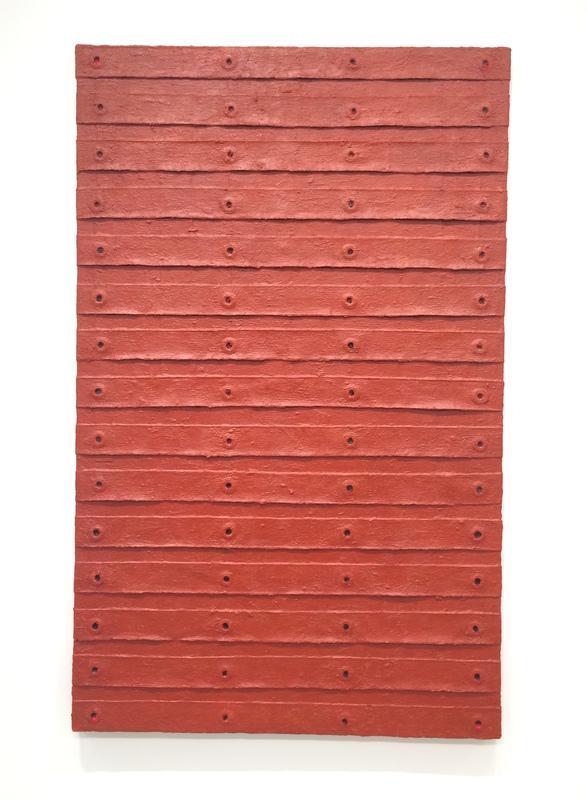 The painting “Red Stack” features a series of evenly placed horizontal straps, as well as a grid of metal grommets. The linearity of the rows of raised strips of fabric is interrupted by the circular grommets. This work has a very sculpture quality with a rough surface that keeps all of the lines and proportions from being hard edged and perfect. 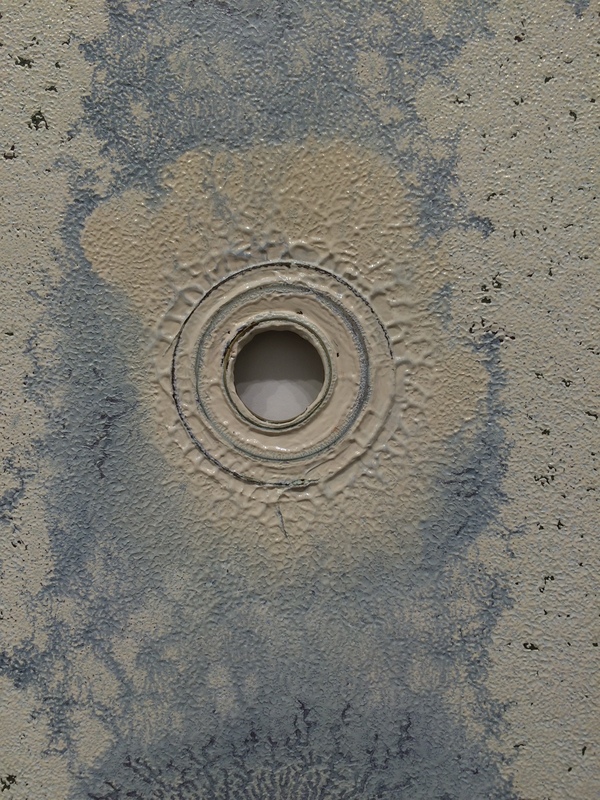 The monotype “White Rims #1” showcases the concentric circles created by the grommets. 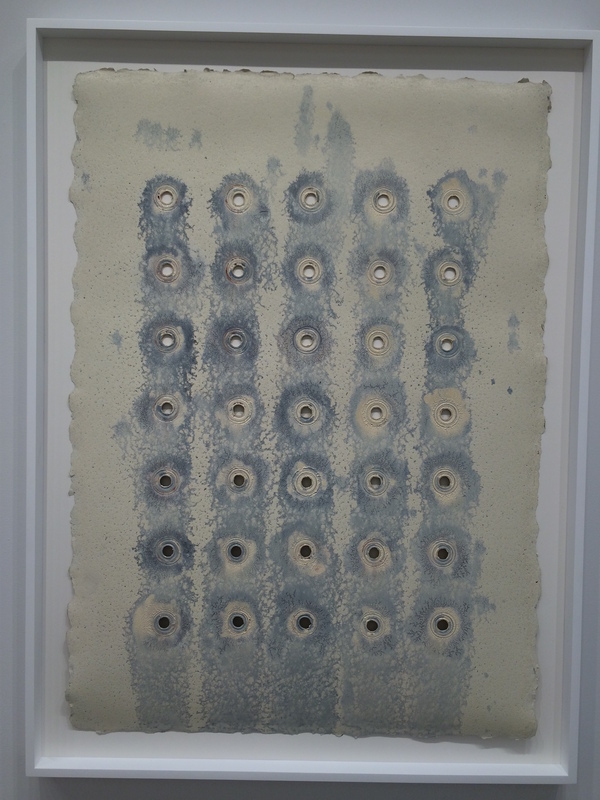 The organized 5 x 7 grid of holes juxtaposes the more random pigmentation of the print. The ink flows and pools and plumes around the structures. The edges of the paper have a rough, almost torn, quality that is in contrast to the gridded repetition of the circles. There is a push and pull of chaos versus order, geometry versus the physicality of Hammond”s artistic process.